I start every New Year with the best of intentions about eating less and moving more. Sometimes I manage to make it through a few days or weeks or months. And sometimes I just end up reading WeightWatchers magazine while chomping left-over Christmas chocolate. So many of the fashionable healthy eating fads seem to involve spending an arm and a leg in search of smaller limbs – from chia seeds to coconut oil, steak, salmon and spirulina. I’m also a bit suspicious of “low fat” labels and processed diet foods, which seem to replace the fat by bumping up sugar, sweetners and assorted weirdness, and push up prices in the process. Realistically, I’m more likely to stick to an “everything in moderation” approach which is heavy on fruit, veg and home cooking. Perhaps I can refer to it as clean eating, and jump on that particular trend? Despite much faffing around and falling off the wagon, I have managed to shed a stone and a half since this time last year, while still trying to keep our shopping bills in check. I’d rather my weight loss looked more like a downward slope, and less like a heart rate monitor, but hey at least I’m lower than I started. So in case it’s helpful to anyone else out there trying to lose pounds without spending too many of them, here are some of the kinds of ingredients I recommend from the value ranges. It reflects my own preferences – so for example I like the tinned grapefuit, but don’t like tinned mandarins, and recommend the marmalade and lemon curd even if I don’t like Basics jam. 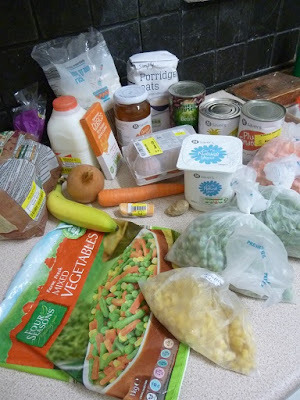 I’ve used examples from Sainsbury’s Basics, but there are similar versions from Morrisons Savers, Tesco Everyday Value, Aldi Essentials and ASDA Smartprice. As I found on Live Below the Line, shoehorning fruit into a minimal budget is tough. Opting for tinned and frozen versions does cut costs, as does buying seasonal fruit, which means things likes apples, satsumas and pears right now. I rely on big bunches of bananas, too. Apples – 80p for at least 4, if you’re willing to take a lucky dip on the variety and size. Pears – 80p for at least 3, which again can be a different sizes and varieties. If I lived nearer to Aldi, I’d stock up on their Super 6 fruit & veg every time I passed. In the mean time, value range fresh veg tend to come in odder shapes or larger quantities, but are still fine in soups, stews and stir fries. Tinned or frozen options are often cheaper than fresh. Carton of chopped tomatoes – 35p for 400g, but keep an eye out for “3 for £1” offers on other brands. Skimmed milk – if you can drink it before it goes off, it’s cheaper to buy a big 4 pint/2.272 litre bottle for £1 than shell out for a litre of Basics UHT skimmed milk for 65p. Protein tends to be a real budget-buster, especially as lean cuts of meat and fish tend to more expensive. Using dairy products and vegetarian options like eggs and pulses tend to be cheaper, although you’ll need to look outside the value ranges for alternatives like chick peas, lentils and pearl barley. Frozen white fish fillets – £1.70 for 520g, good for curries, fish stew, fish pie and fish kebabs. Eggs – I try to buy free-range eggs, and a bigger box of mixed weight eggs is likely to be cheapest, so £2 for 15 from Sainsburys and Morrisons. In contrast Basics barn eggs cost £1.25 for 15. I haven’t been brave enough to try the Basics cooked ham slices (65p for 125g) or smoked back bacon (£1.50 for 250g). Brown and wholewheat versions are likely to leave you fuller for longer. This is a pain because the value ranges tend to be stuffed with super cheap white pasta, white flour and white rice. Porridge oats – for some reason Sainsbury’s doesn’t do a Basics version, and charges £1.20 for 1kg of own brand oats. At Morrisons you can get 1kg of M Savers oats for 75p. Plain flour and self-raising flour – 55p for 1.5kg. Work just fine for baking and cooking, even if wholemeal flour would be healthier. Honey – £1 for 340g, good for cooking too. Milk and dark chocolate – 35p for 100g. OK I admit it’s a bit of a stretch including chocolate on a list of recommended diet friendly foods, but bear with me. Value range chocolate is good for cooking, but unlike a bar of Cadbury’s, I can leave it in the cupboard for long enough to actually make it into a recipe. Result – I eat less chocolate. Anyone else attempting to lose pounds without spending too many? Any recommendations for healthy eating options from the value ranges? I’d love to add more to my list! Basics bacon is fine, just check the packs to find the one that has least fat. I buy the "cooking bacon" packs from wherever I can find them, and that meat is usually chunky and well worth buying. Thanks for the top tip about basics bacon. I've bought the cooking bacon in the past, but tend to end up spending a lot of time trimming off bacon fat! Reckon the Sainsbury's version is better than the Morrisons one. Basics bacon is fine, I use it all the time. If it is chunky pieces, you can either use it in casseroles with lots of veg and red lentils, or something like that, or bash it out flat and thin with a rolling pin. Personally, I leave the fat on when I grill it, and the heat from the grill renders it out, no effort on my part!